Heritage basic 100% cotton knit glove is lightweight alternative with reinforced dot pattern on the palm for increased grip and control. A lightweight, comfortable fit with our stretchable cotton knit material. 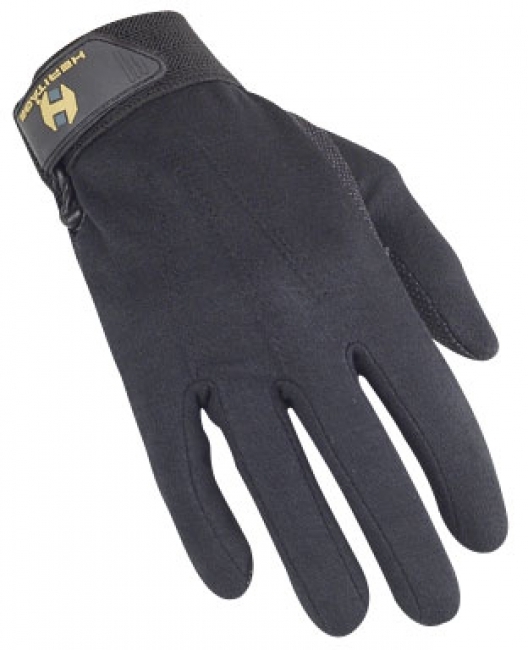 The elastic cuff and adjustable strap closure securely holds the glove on your hands. Made with a stretchable cotton knit material to provide a lightweight feel while riding. The palm is designed to have an excellent grip with a reinforced PVC dot pattern. We have also doubled the material on the top of the index finger, tip of thumb and between the ring and pinky fingers for increased rein control and added protection in all the high wear areas. These gloves perform well for all forms of Showing, Schooling, Training, and Pleasure riding. Official Riding Gloves of the United States Equestrian Federation.